With the Valentine’s Day holiday coming up, I’ve been thinking about who Link might spend it with. There’s obviously Zelda, Saria, Malon, or the less remembered Marin– and hey, he could even call-up Peatrice to see if she’s free on Sunday. But then I remembered, Link was once betrothed! The all too amorous and forward Princess Ruto of the Zoras bagged the Hero of Time when he was just a little boy and has been smitten with him ever since. But if their relationship continued to develop, would the happy couple have fostered any children? My guess is that they wouldn’t have, Zoras and Hylians are just too genetically different, but a Gerudo would’ve done just fine. After the jump we’ll try to determine which races would be able to procreate with each other, and which would have to find a mate within their race. Like I said, the Zoras and the Hylians are just far too different to ever be able to breed with each other. Zora lay eggs, and as Colin’s mom showed us in Twilight Princess, Hylians carry babies the way humans do (that being said Ordonians and Hylians would be able to breed with one another). The way Gorons reproduce has never been show in-game, nor any distinctively female Gorons (as pointed out in a previous article), so it’s likely they reproduce asexually. And even if they could reproduce like Hylians do, Gorons are also far too different structurally from both Hylians and Zoras to ever be able to produce healthy offspring. Could you imagine though, some seemingly Hylian child hitting puberty and suddenly sprouting rocks on his back? I’d take acne over that any day. I suppose being able to breed only within their race is what has allowed the Zora and Gorons to remain strong races throughout the series, there’s no intermingling of cultures or major physiological differences to dilute and divide them into subsections of biracial groups. 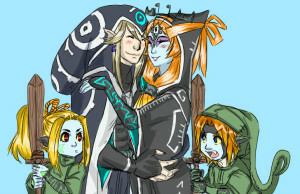 And while I hate to break it to Princess Ruto, if she was hoping for children with Link she’s out of luck. While similar in appearance to Hylians, the Kokiri would not be able to reproduce with any race. They remain children forever, so even if their bodies worked the way humans’ do they’d never mature enough to be fertile or maintain a pregnancy. The Kokiri were created by the Great Deku tree to begin with anyway, so if their race were to expand it would only be through his power and not any conventional form of reproduction. And then there are the Deku, who likely just reproduce through planting seeds they produce at a certain age. Maybe some form of fertilization would be necessary for the seed to actually create a living Deku Scrub? Regardless, they also don’t seem viable for reproduction outside of their race. Koroks, Kikwi, Rito, Minish, Maiamai, and Anouki are all also structurally unique and thus wouldn’t be able to breed except within their races. The Twili on the other hand are more mysterious; their bodies appear similar to those of the Hylians (true form Midna’s especially), however we have no way of knowing how they reproduce and some of the Twili don’t look like their genes would mix well with a Hylian’s. The Twili are descended from a tribe of sorcerers than once lived in the light and were later condemned to the Twilight Realm, where they became “mere shadows of what they once were.” Their deformed and sulking bodies may simply be a result of evolution within their environment, and perhaps because Midna retained the magic their people used to all possess her body looks more closely like those of their ancestors’ which would’ve been more or less Hylian in appearance. If that happens to be the case, I would say the Twili would be compatible with Hylians– but maybe their evolution is now too far removed. Let’s finally see which races in the Zelda series can definitely make a baby with each other: Hylians, Ordonians, Skyloftians, Gerudo, and Sheikah. 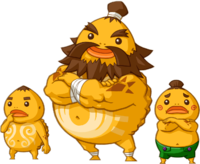 We like to consider the Zoras and Gorons “races” within the Zelda series but they’re really more like species. Ordonians and Skyloftians are a better fit as races that extend from Hylian, which is why I believe they’d all be able to mate. As for the Gerudo, an actual Gossip Stone in Ocarina of Time tells us, “They say that Gerudos sometimes come to Hyrule Castle Town to look for boyfriends.” So we can assume they mate with Hylian men, but I guess all of their children are then fully Gerudo in terms of race as I’ve never seen a lighter skinned Gerudo walking around (a previously posted article has tried to prove this reproduction as a type of unisexual reproduction where the sperm of a man is necessary for fertilization but its genetic information is not utilized). And finally the Sheikah. We’ve never met a real male Sheikah, but since Zelda posed as one it’s clear that they are common within Sheikah tribes as that’s the only way Sheik would be inconspicuous. So we can assume that they reproduce the way humans normally do, and their magic is a part of their genes that wouldn’t interfere with reproduction. As the Royal family possesses some extent of powers as well, and there’s never been evidence of the Royal family having their own race of royals to choose from for procreation, we can assume that magic genes don’t have a problem mixing with that of common Hylians. So if Link wants to be a papa one day, either he and Ruto need to adopt, or he’ll have to find love with someone whose genetics are far more similar to his own (so Zelda and Malon are fair game!). Do you agree with my conclusions on possible cross-breeding between the “races” of the Zelda series? Do you think we’ll ever see a half-Hylian, half-Sheikah (or any other valid mix) actually show up in a game? And just for fun, which girl (or guy) from the series would you want Link should meet up with for Valentine’s Day? Share your thoughts in the comments!